Cassava is an important staple for millions of people in Sub-Saharan Africa. Its tuberous roots provide carbohydrate and the leaves serve as source of protein, minerals and vitamins. Constraints to improvement, difficult to address using conventional breeding, have been identified for priority attention through biotechnology. Routine use of genetic transformation in cassava to develop enhanced germplasm for delivery to farmers requires reproducible regeneration and transformation systems to be applicable across a wide range of genotypes. Regeneration methods based on somatic embryogenesis and organogenesis, compatible with Agrobacterium-mediated transformation and biolistics, have been developed using model cassava genotypes but their general applicability to African germplasm was not assessed. The objective of this project is to transfer and improve existing regeneration and transformation protocols to a range of African cassava germplasm at the International Institute of Tropical Agriculture (IITA). The project succeeded in adapting the organogenesis-based regeneration system to more than 10 African cassava genotypes. Cyclic somatic embryogenesis, organogenesis, and plant regeneration were achieved. Friable embryogenic cultures were successfully established and maintained using the model cassava genotype (TMS 60444) and induction of friable embryogenic callus (FEC) was also demonstrated in two genotypes. Agrobacterium-mediated transformation, compatible with shoot organgenesis and FEC were successfully tested and transient GUS expression has been demonstrated in cotyledon pieces, embryogenic units and clusters. In 2002 emphasis was placed on genetic transformation and production of transgenic plants. By combining our results on the Agrobacterium–mediated transformation and antibiotic sensitivity tests with various cassava tissues and regeneration systems, transformation experiments using marker genes were carried out. Hygromycin-resistant embryogenic units and clusters, and shoot buds were obtained from transformation studies using FEC and organogenesis regeneration systems respectively. 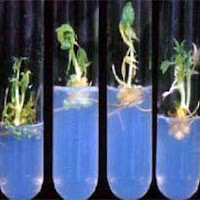 Shoots regenerated from co-cultured cotyledon pieces were all escapes. However many GUS-positive embryogenic units and clusters were obtained from the hygromycin-resistant embryogenic units and clusters resulted from co-cultivation of FEC with three Agrobacterium strains. Plantlets were recovered from hygromycin resistant embryogenic units and clusters, which were transferred, to embryo maturation and germination media, and then to elongation medium. Shoot apex, root and leaf obtained from regenerated shoots as well as whole plantlets were tested GUS positives. These indicated that the regenerated shoots and plantlets were putative transgenic. The transgenic lines were multiplied and molecular characterisation will be carried out on these plants. The fellow has successfully completed his PhD program. This is the first report of success in obtaining transgenic cassava plants in Africa and it will serve as a model for future testing of the capability of other farmers-preferred cultivars to be transformed and to integrate agronomically useful genes into this germplasm at IITA.